Recently, Secunia(Online security and threat watch group) published advisories for the four most widely used web browsers: Internet Explorer (IE), Safari, Opera, and Mozilla Firefox. 31 vulnerabilities were reported for Internet Explorer (IE 5.x, 6.x, and 7), including those publicly disclosed prior to vendor patch as well as those included in Microsoft Security Bulletins. 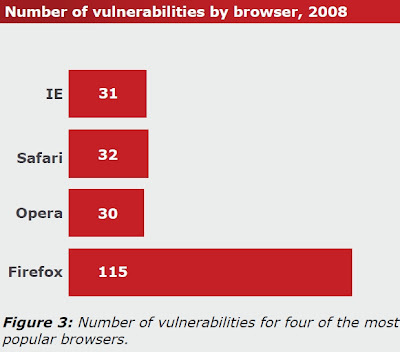 Safari and Opera each had 32 and 30 vulnerabilities, whereas 115 vulnerabilities were registered for Firefox in 2008. To read Secunia's detail report in pdf format, click here. Meanwhile, Mozilla fumed at Secunia's report and lashed out stating it(report) "..is worse than useless, it is in fact very misleading." You can read what Mozilla Team has to say about it by clicking right here. I've no right to put my verdict on if Firefox is the most vulnerable browser or not, but every spotlight gets the attraction of crowd. So, might be the case with Firefox. it's the most vulnerable yet quickly patched. It's built in update system is outstanding.